Happy Friday, friends!! 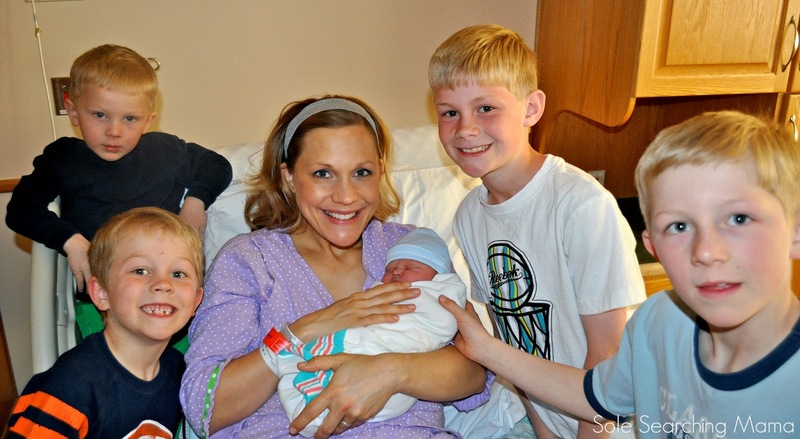 My beautiful friend, Kathryn, who blogs at Team Whittaker, hosted a baby name blog link-up this week. I'm a little slow submitting my post, but I loved her idea, and wanted to take part in it! Digging through old photos of the boys and remembering stories of our early days of parenting has been so much fun. It's easy to get stuck in the day-to-day living, to keep plowing forward through life, and so often I forget to look backwards, to see where we have come from, and how blessed we have been. Mom and Dad: So boys, let's talk baby names. We think it would be nice for all of us to decide on this baby's name. Do you have any favorites? Andrew: Welllll.....(says the family comedian)...I've actually been thinking about this for a while, and I think it's time we have some "P" names. But, only if it's a girl. May I suggest Priscilla or Petunia? You do love flowers, mom! But, if it's a boy, I vote we name him Big Mac. George: I'm only going to share boy names, because I've been praying so hard that this will be a boy, and you said God hears the prayers of children, so I'm confident that he's going to answer my prayers. So, how about Expeditus, after St. Expeditus? Henry: Shoulder shrugs. That's the best we could get from him. The naming of our children over the past 14 years has been such a fun experience for me and Steve. During our college dating days and engagement period, we both fell in love with so many incredible saints, and we knew, right away, that (hopefully) our children would inherit a few of their names. Our desire to bless our children with saint names, and family names as well, is rooted in the hope that they will find strength and encouragement along their journey toward heaven in knowing that there are incredible souls in heaven praying for them, souls that they can look up to, emulate in their daily life, and ask for intercession during times of weakness and struggle. We have no special formula for choosing names for the boys. Sometimes their names have come from our own particular devotion or love for a certain saint during my pregnancies, some names have simply popped into our minds during the course of an ordinary day, and that name has resonated in our hearts. One thing we do agree on is having a name for the baby before I go to the hospital. I have to be able to speak his/her name the very moment they are born! To call our child by name the moment they reach my arms fills me with an indescribable joy! Benedict's name was the easiest for us to agree on. He is named after Steve's great uncle Benedict LaRocque, who was a very holy Benedictine priest, whom we loved very much. Fr. Benedict gave both Steve and me spiritual direction during our engagement, he presided at our wedding and baptized both Ben and Andrew. Benedict's middle names are after his daddy and Steve's dad, Bob. St. Benedict is the father of Western Monasticism, and Benedict has studied the life of his patron in detail and connects in a special way to Benedict's contemplative spirit and spiritual leadership. 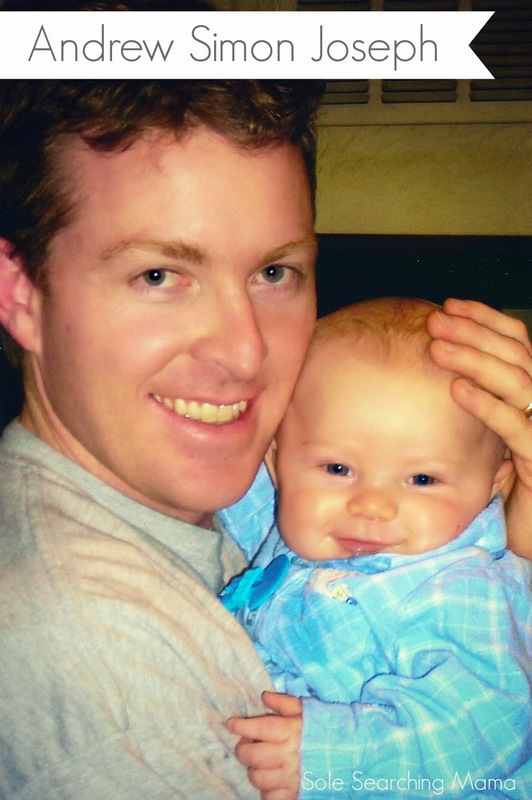 I have loved the name Andrew for the longest time, and knew that one of our boys would be given this special name. One night, while lying in bed, names swimming around in my head, I asked Steve what he thought about naming our second child (if he were to be a boy) after the first two apostles. 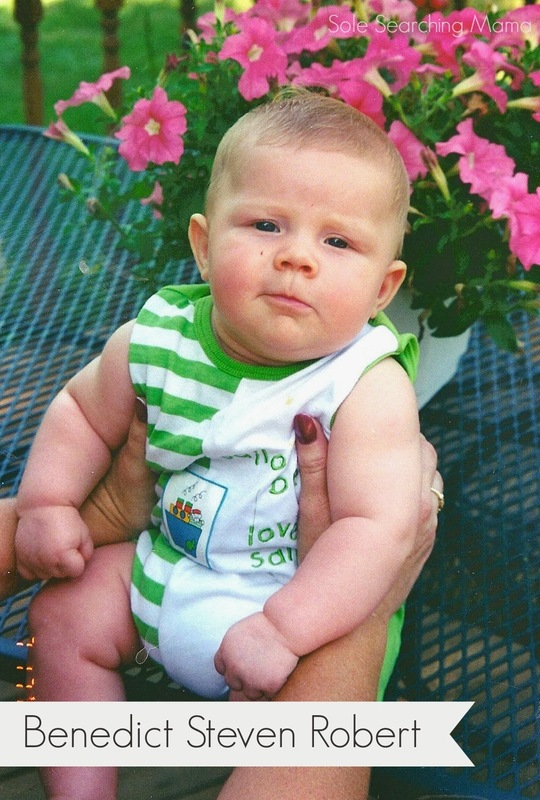 I'll never forget him turning to me with surprise and asking, "Did you know that my guardian angel's name is Simon? I've always wanted to share that name with one of our sons!" That night, Andrew's name was permanently etched in our hearts. As for Joseph, well that's an easy one, who wouldn't love to bear the name of our Lord's earthly papa? Andrew keeps a little statue of St. Andrew beside his bed, and asks St. Andrew to pray for him to have courage before every sporting event. Of all of the boys, George is the one who is most proud of the saints he's been named after. George's name has a three-fold meaning. First, he is named after St. George, whose story is especially appealing to boys, because legend has it that he once slayed a dragon, rescuing an entire village from fear and death! Secondly, George is named after my dad's father, George, who was also one of five boys (he had a sister as well). Lastly, During my pregnancy with George, after reading A Man of the Beatitudes I fell in love with Blessed Pier Giorgio Frassati, an Italian saint who, although a member of a wealthy family, lived a life of deep humility, great generosity and zeal for the gospel. 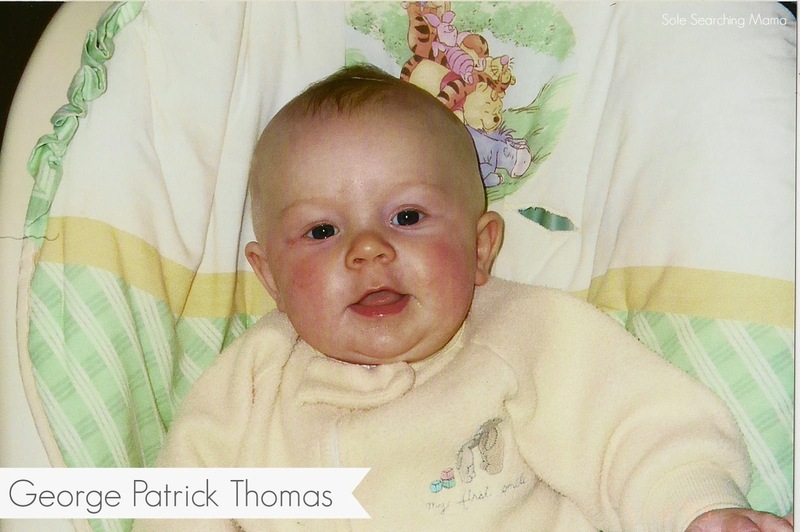 Patrick comes from the famous St. Patrick of Ireland, and the name Thomas is in honor of St. Thomas More. Oh, Henry!! I recall, with great distinction, reading about the 40 Martyrs of Wales and England, and being deeply touched by St. Henry Morse's tenacity, courage and devotion to the people of England. His story stuck with me for the longest time, and so did his name! Thus, Henry's name was chosen, and thankfully, Steve liked the name, too. James is the name of Steve's grandfather on his mother's side, and Augustine comes from St. Augustine, the son of St. Monica who experienced a great conversion and eventually became a bishop! 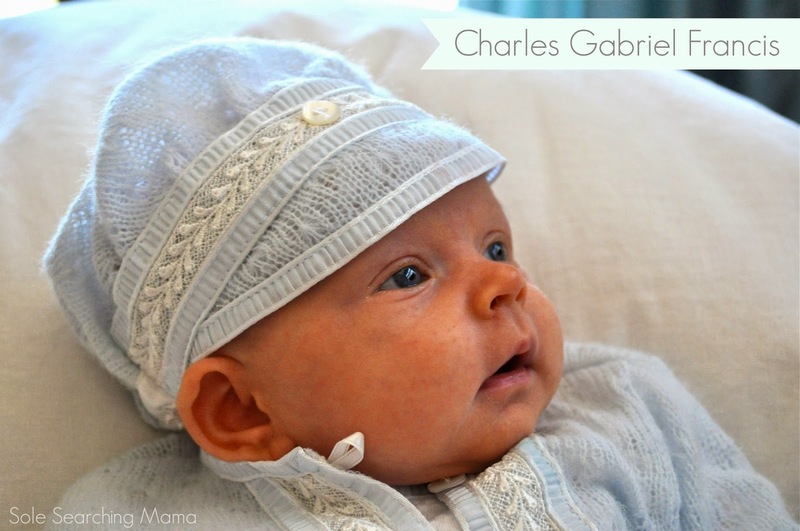 I have to be honest, it was my true desire to give our Charlie the name Gabriel as a first name. But, Steve couldn't quite get over him being called Gabe his whole life. Everyone has a different feeling towards certain names, and I wanted Steve to love the boys' names as much as I do, so Gabriel became the first middle name. Being pregnant during Advent is such a joy for me, and I found St. Gabriel's encounter with Mary to be one of profound beauty, so I quickly became very fond of Gabriel. Charles' first name honestly bloomed out of a pure love for the name Itself. But, St. Charles Borromeo, patron saint of learning and the arts, will one day be a champion saint for Charlie to look up to. As for Francis, well, who among us does not love the incredible story of St. Francis of Assisi? When Steve and I went to Rome to have our marriage blessed by then Pope John Paul II, we took a train ride to Assisi, and it was on that trip that my love for Francis truly bloomed. What name will be given to Husband baby #6?? The family conclave is still in session over that one! Want to join us?? Share your favorite boy/girl names in the comments! Since I've given our favorite boys name to another friend, I might as well keep the ball rolling so maybe there will be a bunch of him in the near future. My vote is Campion. With our last baby, it came down to Campion or Kapaun. Kapaun won out, but Campion is up next unless I come across another that swoons me over. You can't beat a good St. Edmund Campion story. We were going to call him Camp. Can't you hear it on the football field now!!! All I have to say is that you have some adorable little babies! :) Blessings on your newest one from one mama of 6 to another! Well, in our house we have Tyler Andrew, Jesse Dean, Henry Joseph, Levi Wayne, Sarabeth Mae, Charley Ann, John Raymond, and Gabriel. My husband still hadn't realized he was a catholic when our older children were born and I struggled to find saint names that he liked. As you can see he has converted and now it's "only saint names for our kids". I really like the name Isaac for a boy and Eve, Grace and Ruby for girls. Hope this helps with the conclave. I loved hearing how you picked the names and who they represent. I noticed that they all have 3 names - is that significant or just something y'all wanted to do? Your boys and mine share many names. All of our kids have a saint's name and a family member's name. Good luck finding a name you all like and fits that little one to a T.
I'm not sure I can pick a favorite. You remind me that there are, indeed, strong and beautiful names for boys. I think Henry James may be my favorite, but only by a narrow margin! If this is your streak, then you will totally rock the name for baby #6. Can't wait to hear the name (and squeeze the cheeks!) of the newest babe in your house. I forgot that Jude and Henry shared a middle name. I love St. Augustine! St. Jude is pretty cool, too! Emma Grace is named after my great grandmother and St. Emma (there's more than one, early saints not much info.) Grace is for Our Lady of Grace. Mary Rose was due near Our Lady of the Rosary's feast day, so it just seemed appropriate that she be named for the Blessed Mother. Matthew, Andrew, and Jacob don't have saint middle names since they were born before my true conversion. 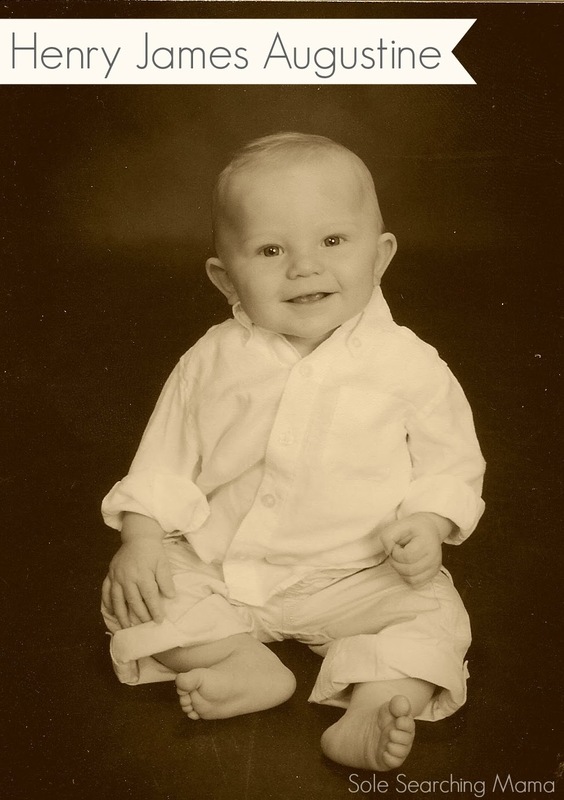 Benedicts face in that baby picture is so cute. I don't have any name suggestions really. We used all our favorite girls names, the first two being family names and the second two being names we love. They all have some Catholic aspect too (middle name mostly). Boys names I really don't have any on my list! We always liked Peter, but it went very poorly with our last name. We used Patrick James, Samuel Robert, Nicholas Daniel, Natalie Elaine, and Miriam Rachael. Otherwise the names in the hopper were Josephine Eleanor and Sean Michael, but I don't think we will get to use them.